A. J. Nygaard came to America from Denmark, he was born December 14, 1866, his trade was creamery work. He worked on a farm in Nebraska for a time after coming to this country. 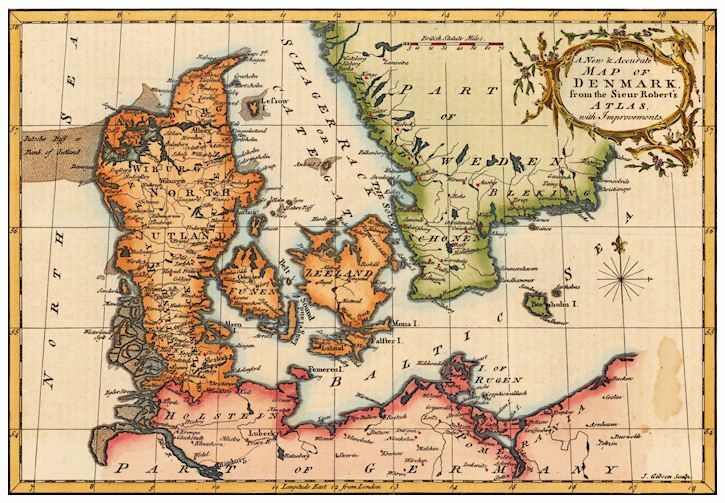 To see a larger version of the map, click on it. He shipped to Bottineau, N. Dak. from Nebraska and then hauled his possessions by wagon across country to Flaxton. Finding safe places to ford the Mouse River took extra travel. He filed on a homestead north of Flaxton in Richland Township in 1899. Extreme cold temperatures, much wind, dry summers, high freight rates which the settlers paid on everything coming in or going out, high interest rates and low grain prices are normal for this region. A good well was hard or impossible to find on many farms. He dug for water many places on his farm, but he finally like many others had a well drilled, it was 365 feet deep. Besides giving up water it also gave much trouble; it had to have new leathers installed in the cylinder once a month the first year and later not so often. Pulling eleven lengths of twenty foot pipe and draining the water out of them in zero weather was not an easy or pleasant job. Those who came to settle in the spring of 1900 were greeted by the sight of burned prairie. 1900 was a dry year, no crop was harvested and for hay many went to the hills south of Flaxton and made hay in sloughs there. A. J. Nygaard married Margrete Anderson in 1905, she had come to America with her parents in 1894. 1906-07 is remembered as the winter of the big snow, many smaller buildings became covered with snow, others surrounded by huge snow banks, sleigh tracks grew higher after drifting and each snow fall, until it was impossible for travelers to get by each other on the roads, many are the stories of the disaster that befell a horse or rig that got off the trail. A. J. Nygaard died in 1946. Mrs. Nygaard preceded him in death, she passed away in 1924. They had three children, Norman, Helmer and Margaret. Norman and Helmer now farm in the same place north of Flaxton. Margaret lives near Great Falls, Mont. There are eight grandchildren and two great grand children. When one thinks of the hardships these early settlers went thru people wonder why they stayed. One reason that many did not leave was that they simply had nothing to leave with. As A. J. Nygaard jokingly or seriously was known to remark, "We do not live, we only stay. We are too poor to go away." Horses and oxen were the source of power in the early days and the lumber wagon, as the big wooden wheeled wagons were called, the main vehicle of transportation of supplies. A. J. 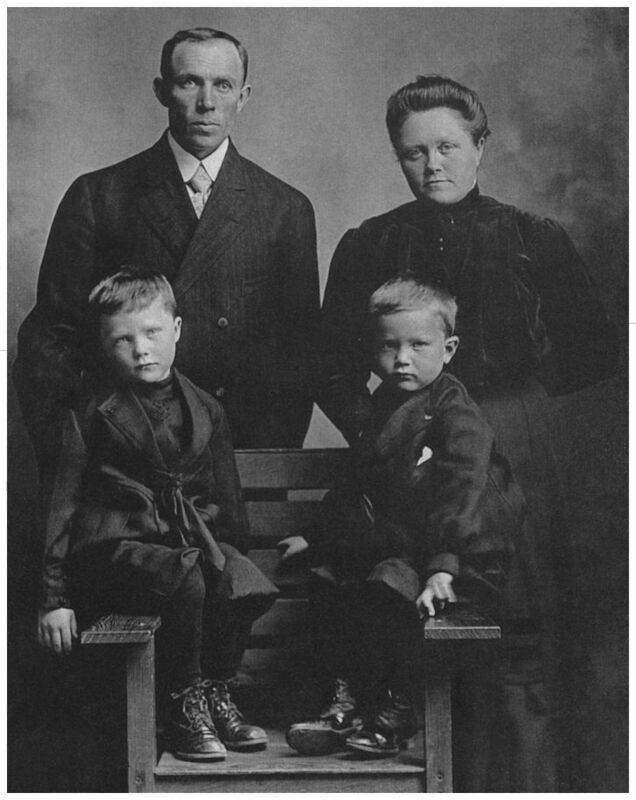 (Anders Jorgen) Nygaard, Margrete Anderson Nygaard, sons Norman and Helmer Nygaard, probably taken late in 1910. I (Helmer Nygaard) was born, March 1908 on my parents farm, two miles north of Flaxton. My parents were Mr. and Mrs. A. J. Nygaard. I attended school north of the farm home and worked on the farm. During the dry thirties I spent nearly two years on the west coast working on a cattle ranch which was located 125 miles southwest of Spokane, Wash. I worked on dairies in Oregon and California and also worked on highway construction in California. I later spent a year and a half in Oklahoma and Texas working on dairies and I pulled broom corn in Oklahoma. I returned to the farm in 1940 and was called into the Armed Forces in May 1942. I received my basic training at Jefferson Barracks, St. Louis, Mo. and was shipped over seas on July 20, 1942. We landed at Melbourne, Australia on September 1, where I was with the 35th Fighter Squadron, 5th Air Force. I spent nearly two years in New Guinea and then on to the Philippines and I was on Iwo Jima when the war ended. I returned to the states about October 1945. I married Wilma Paul in June 1948. We made our home in Flaxton and farmed. A son, George, was born on April 22, 1951. He is presently attending school at the University of Williston. I was on the city council a few years until we moved to Kenmare in July 1971. We built a new house in Kenmare where we still reside while still farming north of Flaxton. I (Wilma Paul) grew up on a farm southwest of Noonan. My parents were Mr. and Mrs. (Lena) Herman Paul. I attended the local rural schools. High school was limited but in May 1936 I earned a second grade professional teaching certificate. That fall there were three to four teachers for every school so I was happy to find a rural school to teach near Grenora. From then on it seemed I could always find a teaching job. I have taught in Divide, Williams, McLean and Burke counties. I still fondly remember many of the elementary pupils. As a young girl I remember helping the neighbor women "cook for threshers." In the thirties one year I managed the situation myself for which I got the huge sum of two dollars a day, same as the men got. The reason was that I could drive a car! When I lived at Flaxton during 1948 to 1971 I belonged occasionally to several local clubs such as the Homemakers and American Legion Auxiliary. I was a member of the St. Pauls Lutheran Church, the Ladies Aid and sometimes taught Sunday School. Norman Nygaard, one of three children of Mr. and Mrs. A. J. Nygaard, was born November 29, 1906 in Richland Township north of Flaxton, N. Dak. He attended school and completed eight grades in the county school house now located on the Burke County fair grounds. At the age of twenty Norman went to Wahpeton where he continued his education with such classes as auto mechanics and shop. After this he also was enrolled at the Tyler Minnesota Folk School for a course in general improvement. During the depression of the 1930's, Norman left the Flaxton area and journeyed westward, seeing the country from boxcar doors. In this time he met and married Mereith Urton of Great Falls, Mont. They were wed October 16, 1937 in Ft. Benton, Mont. After returning to North Dakota the Nygaards became involved in the reorganization of the Richland Farmer's Union Local No. 430. Norman held the chairmanship of this local in its new beginning during the early 1940's. Was secretary-treasurer of the Farmers Coop. Oil Co., Flaxton for many years, and a board member of the Burke Co. Farmers Union for some time. It was by the work of these organizations that some improvement was done for farmers, such as R.E.A.-R.T.A. lower fuel prices and some higher grain prices for a time. Parents-Teachers Assn. was organized in the Flaxton school and set up one of the first hot lunch kitchens in the area about the year 1948. Mereith was P.T.A. chairman at this time. They have four children, Marcia, Leland, Connie and Patricia and farm the home farm at this writing. 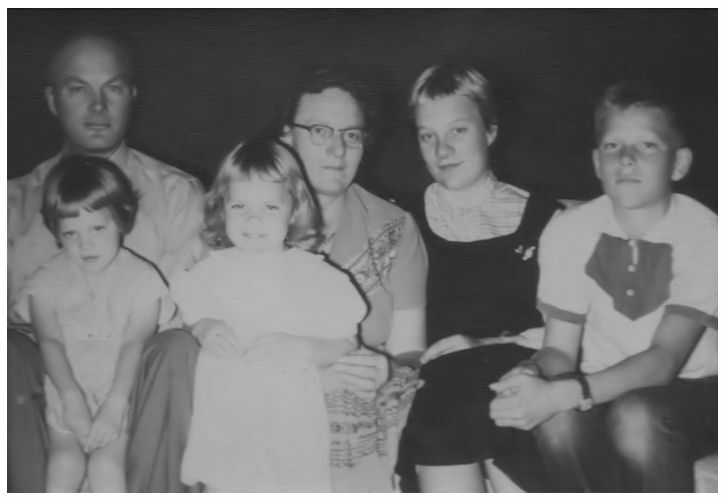 Rear, left to right, Norman and Mereith Nygaard, Marcia and Leland. Front, left to right, Patricia and Connie Ann. Taken about 1956.